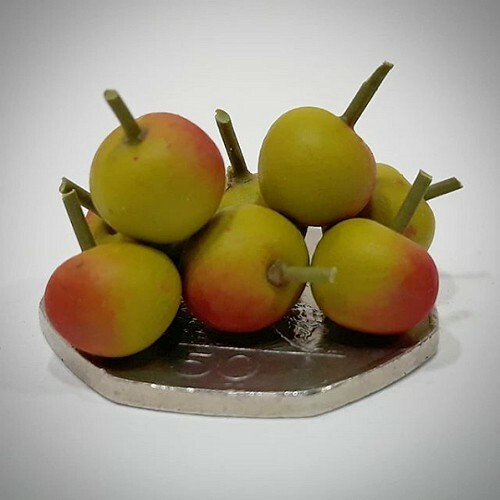 How to make 1:12th scale apples, according to the workshop I attended. Take 2 parts yellow-green, one part orange and 1/2 part dark green Fimo clay and mix until there is only one shade. Poke a dimple in the top. Dimp a length of green stuff in glue, push this into the dimple and cut to length. Dab red dust from an artists pastel on the apple with a paintbrush. Fire for 45 minutes in an oven. It was all good fun. I was a bit quicker than most of the others around the table, partly because I have some practise at this modelmaking lark, but mostly because my hands were warm enough to quickly mix the colours. Some found the clay crumbled at first! I also asked why they use the clay that has to be fired. Apparenlty, unlike the air-dry version, it doesn't shrink when dry. You can also leave and return to a piece as you like without worrying about it setting. Good fun for 20 minutes - I recomend having a go if you get the chance. Reminds me of the marzipan fruits we had at Christmas as kids, yum!